Thankfully, there’s four-wheel drive as standard, so you’ll rarely feel the car lose grip in the dry. The traction control has a harder time of things in the wet but does ensure the car always feels sure-footed and on your side. Instead, you’re better off saving the volts for stop-start traffic. In this environment, the performance is more than adequate and the battery will last far longer. But while you’ll be saving plenty of money in fuel, we did find the gearbox to be occasionally jerky when changing cogs at low speeds. 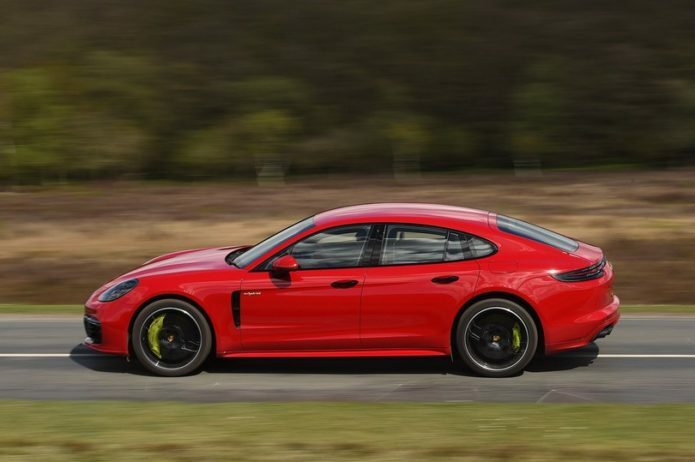 It’s a minor gripe, but then this Panamera does cost nearly £140,000/$193,200. E-Hybrid versions of the Panamera get a few model-specific displays for both the main infotainment screen and the instrument cluster in front of the driver. These let you see how much you can put your foot down before the V8 kicks in, how much electricity you’re using and various other bits of information. The rest of the interior is very familiar; there’s plenty of space for four tall adults, lots of high-quality materials and a massive infotainment screen. Although the Panamera Turbo S E-Hybrid is easily the fastest model in the range, it’s not the one we’d recommend to keen drivers. If you’re expecting us to suggest the regular Turbo, then you’re wrong; it’s actually the V6-powered 4S that has the best blend of performance and handling. So what about running costs? Sure, the Turbo S E-Hybrid looks tempting, but the regular E-Hybrid is far cheaper to buy, emits even less CO2 and will be more economical to boot. Where does that leave this car, then? Well, there’s no sensible reason to buy one, but it does combine face-melting performance with liveable running costs astonishingly well while remaining a comfortable cruiser. Then there’s the small matter of company car tax; a regular Turbo is in the 37% bracket for benefit-in-kind tax, while the Turbo S E-Hybrid is in the 16% bracket. That’s a big saving for even the richest of businesspeople. As a money-no-object, do-it-all kind of car, this one is hard to beat.